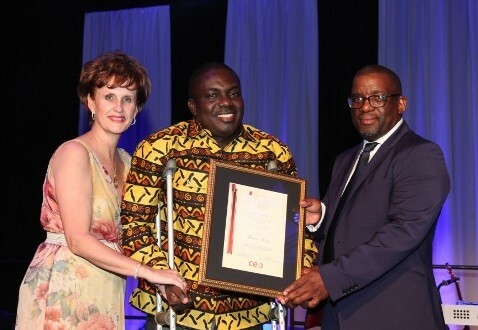 Mr. Francis Asong, Director of Voice of People with Disability Ghana (VOICE GHANA), has been adjudged the Continental Winner of the CEO Global Titans – Nations Building 2015 Awards. The award ceremony held on 10th November, 2015 at the Gallagher Convention Centre, in Midrand, South Africa, was to recognize individuals who contribute significantly in the sustainable development and growth of the African continent. The awards focuses on various spectrum of human endeavors including businesses, civil society activities and governance across Africa. The award is in recognition of Francis Asong’s contribution to the Welfare and Civil Society Sector in Africa. Mr. Asong had a long-standing interest in social inclusion agenda for persons with disabilities in Ghana and is an expert in the use of Participatory Methodologies for facilitating development programmes for marginalized and socially excluded people with disabilities at the grassroots. Mr. Asong earlier won this award at the Ghana Country and West Africa levels, which was held in Accra on 6th October, 2015. Mr. Asong dedicated the award to the marginalized and socially excluded people in Africa, especially persons with disabilities.